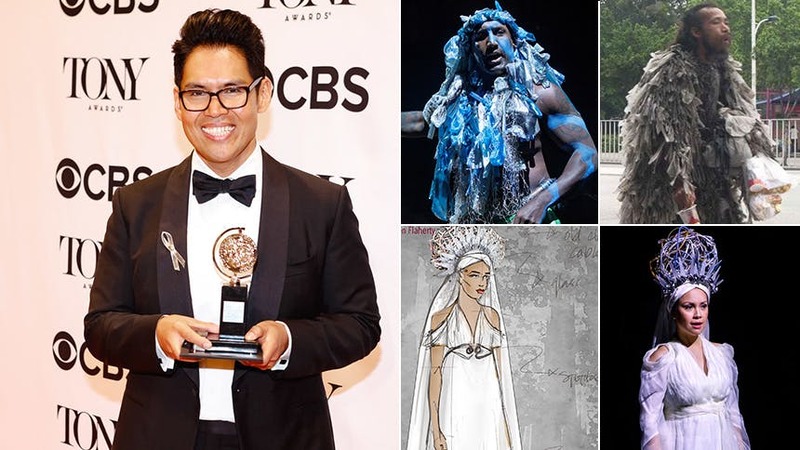 Tony Award-winning costume and set designer Clint Ramos is one of the most in-demand designers working in New York, and this season he celebrates his second Tony nomination for his incredible work on the revival of Once On This Island. His Broadway resume includes beautiful, thoughtful designs for Eclipsed (Tony win), Six Degrees of Separation, The Heidi Chronicles, The Elephant Man, Sunday in the Park with George, Violet, & In Transit and off-Broadway’s Paradise Blue, Torch Song, Sweet Charity and Here Lies Love (Lortel Award). BroadwayBox caught up with the 2018 Tony nominee to discuss the inspirations for and hidden details within his stunning costume designs for the gods of Once On This Island. Because I’m working on so many, multiple projects at the same time, the inspiration doesn’t come naturally. And so, I actually have to really work hard to find an anchor in the piece or the music to anchor myself emotionally to it—that’s the only way I can work. So, I read and reread the script to find something that will make me be consumed by it. I almost feel like part of my process is to get obsessed by a project. I think for Once On This Island, it really was looking at all these photographs of hurricane-ravaged Haiti and the Caribbean Islands. Just seeing the desperation and the hopelessness that those people felt—it showed in their faces—and also the resiliency. It was kind of like a simultaneous desperation and resiliency that was present in them, and that really hooked me into it. I latched myself onto that then it just snowballed into this idea of that the only way to really get out of this kind of desperate, emotional place is by telling stories to each other that ultimately, whatever happens, we are going to be okay. A collective force, whether it be bigger than us, or us together, will help propel us forward. I think we really can’t talk about these gods without talking about who they really are—they are storytellers. So, Agwe is the fisherman, who lost most of his boats, his nets, everything. In the beginning of the play, he’s painting his last boat, trying to repair it. He is also collecting trash bags—these blue and white trash bags that seem to be ubiquitous in these countries and also are polluting a lot of the oceans. There’s so much plastic in our oceans right now that it’s really crazy. His base costume was based on a photograph that I found in Haiti, and so we just replicated that. And then slowly as he transforms, and the stuff that you thought were just mundane stage business, actually play into eventually what he looks like as a god. So, the paints that he uses for his boat, he actually paints on his body. Then, he weaves those plastic bags into this kind of beard and headdress structure that he puts on top of his head and around his face. Then there’s fisherman netting and some fisherman tools around his waist. That’s his costume. We keep the board short that he wears in the beginning to not lose that idea that these are still people. There is this idea that the gods are within us. In the beginning, her tended to a bunch of farm animals, chickens and goats, and she has a truck. She actually is the original owner of the goat. But because of the hurricane, she kind of lost her mind. She lost everything—all of her animals, except for this one goat. We see her with this goat collecting all these Coca Cola cans. Her first look is just sort of a ravaged state, what she would have looked like during the hurricane, and never really recovered from it. Eventually, she becomes homeless; her hair is matted and she’s dirty. Then, when she transforms, the Coca Cola cans that you saw her collecting in the beginning becomes this harness—a fine structure that she wears on the back of her body. It’s sort of reptilian in a way. It just invokes something really slithery and something demonic. She has horns that she fashioned into her headdress. Then she paints herself with basically the grease from the truck. Also, a lot of the way she looks is influenced by this festival in Haiti (in Jacmel), which is basically like a Mardi Gras, where everybody takes on different characters. A lot of the men actually become this devil, demon kind character, and so it’s also based on that. Erzulie is fun, but I can’t really talk about Erzulie without talking about Lea Salonga. When Michael cast Lea, I was super excited, but it presented us with this conundrum: how does a person who looks like Lea belong in this world, in this hurricane-ravaged, Haiti? So, we poured over all of our research photographs, and we saw a lot of these Doctors Without Borders nurses and doctors. All these medical people coming down to Haiti to help the people, and so we were like, ‘Okay, so, we now know who she is the beginning.’ So, let’s make her nurse, but then how does she transform into Erzulie? Looking into all the mythology of Haiti, Erzulie takes on different forms, but the goddess of love is usually rendered in white, because a lot of the iconography is based on the virgin. So, we actually begin the show with her in khakis, and then she puts on white scrubs, as if she’s going to perform some sort of like backyard surgery. She’s also distributing these mosquito nettings in the beginning to the people. If you catch most of the beginning of the preshow, she’s actually handing out mosquito nets. So, the whole costume of Erzulie the goddess is made entirely out of mosquito nets and her belt is two stethoscopes fashioned into a belt. Then her headdress is basically a basket made out of electrical wires. We saw this piece of research where all of these electrical wires by the telephone poles were all just bunched up, and somebody was trying (in the photographs) to carry it away—I guess to recycle or just sell later on—and that person had it on his head. He was carrying this big ball of wires on his head. I said, ‘Because her station is by the telephone pole, why don’t we make her a headdress out of all of this stuff?’ So that’s where the headdress came from. Then, all of a sudden, we thought what if it would light up? She’s a goddess, so what if the little balls light up in her number? And that’s basically the story of Erzulie’s costume. Alex is the Mother of the Earth, but Alex is a man, so it’s important for us that we telegraph his life in the beginning. So, he’s basically this (I would say) very, very effeminate man cooking in one of these makeshift, outdoor eateries. He’s cooking, and he has this large floral table cloth, plastic table cloth, which is ubiquitous to these countries. Then, as the musical progresses, he uses that tablecloth as a skirt. I think the hardest piece to work with would probably be Alex’s skirt because it’s made entirely out of plastic. When he fully transforms into the god, we do it in steps. We actually blow that table cloth up and make it into a very voluminous ball skirt. Then he finds plastic flowers from the garbage and makes it into his headdress. We keep the Atlanta Falcons jersey on him as his top, and then add a little bit of gold makeup on his face, and he becomes Asaka. The final piece of that really was when Michael decided he wanted to do a preshow. That was our opportunity to actually contextualize everything. I still think that even without seeing the preshow, the design holds up, but I think what’s delicious about the preshow is it becomes rich and layered because you actually really know the story. There was also the reason why we kind of staggered the transformation, so, we as an audience know that these gods are just not appearing from the heavens. We as an audience are also complicit in creating these gods. See all of Clint Ramos' costumes live at Once On This Island at Broadway's Circle in the Square Theatre.